Another shooting has taken place in Ferguson, Missouri -- and this time, two police officers were the victims. The violence should not come as a surprise, given the ugly tone set by the nation's top law enforcement officer, Attorney General Eric Holder. The most divisive attorney general since Richard Nixon's John Mitchell, Holder has fanned the flames of racial grievance for much of his tenure. In his early days in office, he called America "a nation of cowards" on racial issues. Last week, his target was the Ferguson Police Department. Holder promised, "We are prepared to use all the power that we have ... to ensure that the situation changes there." No, he didn't intend for someone to try to kill two police officers by shooting them in the face. But by portraying the police department as racist to the core, he contributed to the culture of vengeance that led to the shooting. There is no doubt that the Ferguson Police Department has major problems and needs reform. As the 105-page Justice Department report issued last week documents, city officials have seen the police department largely as a cash cow: "The City budgets for sizeable increases in municipal fines and fees each year, exhorts police and court staff to deliver those revenue increases, and closely monitors whether those increases are achieved." The main sources of those revenues are criminal and civil fines. The policy encourages police to make more traffic stops, conduct more searches, issue more tickets and make more arrests and the courts to issue more warrants and fines to drive up revenues. It's a lousy policy -- but one not unique to Ferguson. If the Justice Department were truly serious about changing the abuses more broadly, it would have conducted a larger study that looked at similar patterns in other localities -- including largely white tourist towns, where traffic tickets are often a huge source of revenue. But Holder isn't interested in the insatiable appetite of government for more revenues. He came to Ferguson in search of racism -- and of course, he found it. 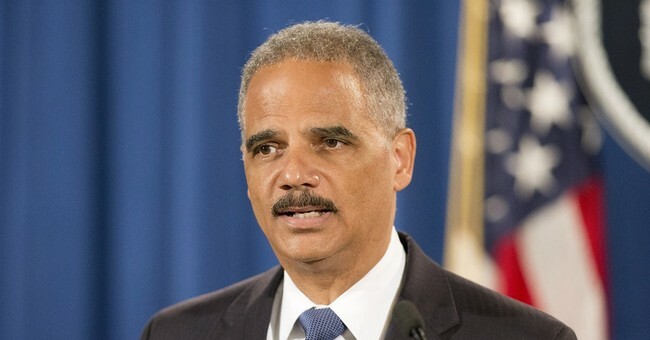 It was predestined from the moment President Barack Obama announced he was sending Holder to Ferguson to investigate the shooting of Michael Brown last August. Perhaps the greatest irony of the Justice Department's investigation is that it cleared the Ferguson police officer who shot Brown, Darren Wilson, of any wrongdoing in Brown's death. Obama, Holder and many of the liberal media were quick to suspect that Wilson, who is white, shot Brown because he was black. For months after the shooting, protesters around the country adopted the mantra "hands up, don't shoot" to describe Brown's actions before he was fatally shot by Wilson. Now the Justice Department's investigation has concluded that nothing of the sort happened. According to all available forensic evidence and credible witnesses, Brown attacked the police officer and was in the process of charging toward him when Wilson fired the fatal shots. Racism wasn't responsible for Michael Brown's death. Brown's own behavior precipitated his unfortunate end. Blaming racism for every statistical disparity that exists between whites and blacks -- from education to income and poverty to crime -- gets us no further in solving the problems that exist for many black Americans. Nor does it get us closer to wiping out the racial prejudices that do, unfortunately, still exist among a minority of the American population. But those prejudices -- examples of which were found by the Justice Department among police officers in Ferguson -- are not unique to whites. In every study of racial attitudes among Americans, whites are no likelier to harbor prejudices against people of other races than are blacks, Hispanics or Asians. Eric Holder will leave office as early as next week if the Senate confirms Loretta Lynch to be his successor. It will be none too soon. A man who could have done much to improve race relations will instead leave behind a sorry legacy of inflaming racial tensions when the nation most needed a healer.